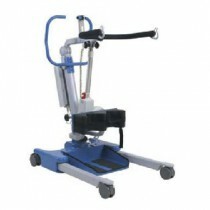 Manual Hydraulic Patient Lifts use hydraulic fluid as the force to move the hoist mechanism. 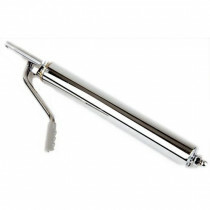 A simple crank is attached to pump the fluid to provide lifting force. 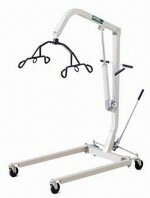 Manual Patient Lifts require less physical energy to raise the patient. 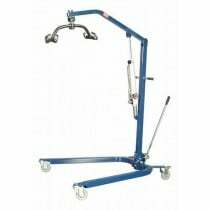 The person cranking the lever uses minimal effort since the hard work is accomplished by the hydraulic fluid. 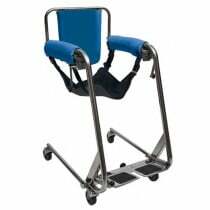 These lifts offer a safe way to lift mobility patients who are unable to physically get out of bed or a chair on their own. 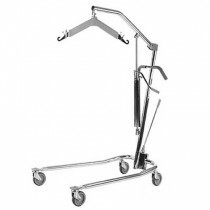 These lifts help protect patients from injuring themselves while moving around. 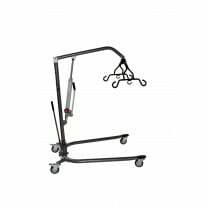 At the same time, they also protect caregivers from physical injuries or strains due to having to physically lift the patient. 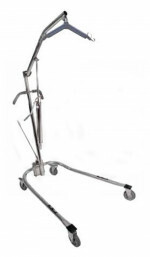 Since the discovery of patient hydraulic lifts, injuries to mobility patients and caregivers have significantly been reduced. Browse the products below and find the best product for your needs. 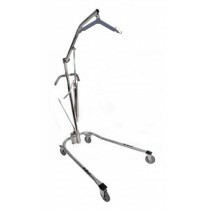 If you are looking for slings, Vitality Medical carries lift slings to fit all lifts. Hydraulic Patient Manual Lift Demonstration Proper techniques when moving a patient from a wheelchair to a bed. Hi my name is Scott Holsten, physical therapist at Carolinas HealthCare System - Carolina's Neuromuscular ALS and MBA Center. 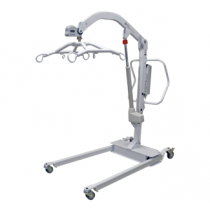 I'm going to show you how to use a hydraulic patient lifter and sling to transfer a person from the wheelchair to the bed and then back from the bed to the wheelchair. First, if they're in a power wheelchair you want to make sure the power wheelchair is off. If it has a retractable joystick handle or swing away arm, moving it out of the way will reduce risk of damage to the component. Also, making sure the seat belt is unbuckled for the patient once there securely in position in the wheelchair, and also lifting the leg rest up. We're going to put the sling in with the handle on the outside or in the back. We're going to help the person lean forward - staying close to your body - and then sliding the sling back behind the patient. You want the bottom part of the sling close to the person's pelvis, sliding down low towards the cushion, and then helping the person rest back on the seat and helping them get their head back. With the the leg loops, trying to make sure there are no twists as you place it under the person's leg. Lifting the leg up and then pulling the leg strap through. The higher you can get the leg strap up, the less the person will slide through the hole that's created by the divided leg sling. If the person has poor trunk control, you can also have the wheel chair tilted posteriorly so they're back is weighted. There's different methods with the leg straps. Frequently, crossing through, keeps the the person from sliding through the hole as it prevents a gap. You can also do the straps crossing under both legs without crisscrossing if the person is wearing slick, athletic pants. 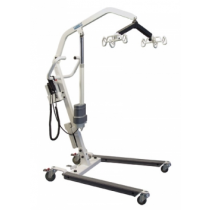 This typically has worked in the past to keep the patient from sliding forward, but we'll use the more traditional method of crossing the straps. Then you just want to make sure the person's arms are inside the lift. Bring the lift over to the patient. Next, I'm going to use the lever to open up the base of the legs to get around the chair. You might be required to lower the lift arm just a little bit. Tuck both sets of loops through. This position, with the farthest loop, or the closest loop in, would have the person sitting in a more upright position. If they're going to lay back in bed, or they need to be flattened, we can go to the most outside loop or if someone's unable to tolerate being more at a 90 degree angle with our hips, you can also put it in the furthest loop out. Next, I'll secure the break, just watching to make sure the straps are not hooked on the wheelchair or arm rests. Put their head back a little bit and just be mindful that the person's legs or feet do not hit the bar. We're clear out of the chair. 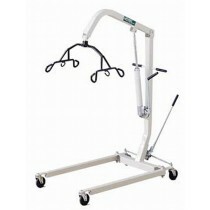 We're now going to pull the lift back, it's easier to maneuver the chair with the base narrower. We're going to take the patient to the bed making sure the area under the bed is free of any materials, cords, lines or tubes are tucked away and placed to the opposite side. It might be required to lift the client up a little bit more so their bottom clears the edge. We're going to use the handle to move the leg around and then push in. 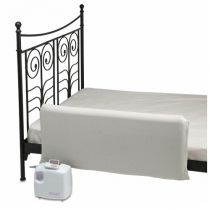 Depending on the heights of some beds, you still might be required to do a little bit of lifting. Pushing the lift all the way in and then it's easier to move the person when their weight is supported by the lift and moving them towards the middle of the bed where they will be laying. Next, locking the brakes again and then slowly lowering the lift back down, unhooking the straps, and then moving the lift away. 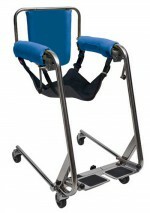 To remove the straps, just slide it out from underneath the person's legs, moving an arm, helping them bend a leg, turn to the other side, folding the sling up in half, and then assisting the person to roll back to the other side taking care not to pull on their arm, them moving their head. Turn to the other side and then pull out the sling, assisting them to lay back in the middle of the bed. And that's how to use a hydraulic patient lift transfer to move a person to the bed.